Home Music Evan Christopher: Django à la Créole Live! Evan Christopher: Django à la Créole Live! 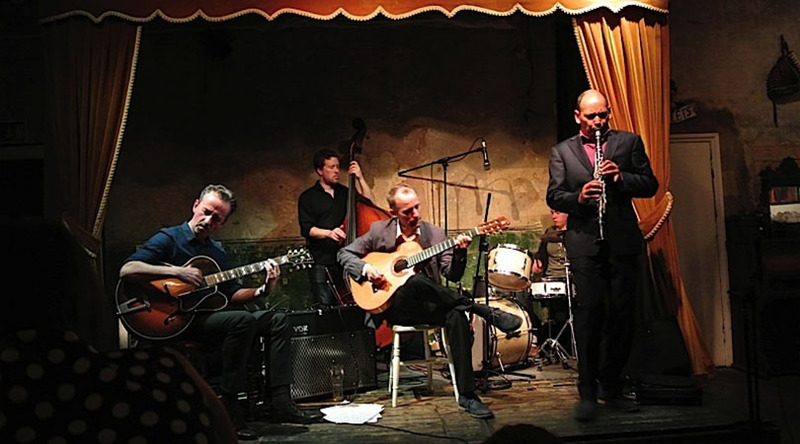 Evan Christopher’s band, Django à la Créole is a band like no other. To begin with the music fostered by Mr. Christopher and his band pays homage to his roots—New Orleans. Now there are many bands that pay tribute to New Orleans, some better than others. But truly, there is no ensemble like Evan Christopher’s. That’s because New Orleans, to most would mean Congo Square and Gumbo and Bourbon Street. But New Orleans is much more than that. There is a part of Spain in it when begat the Spanish tinge in contradanzas; and France, in gigues and bourées, some say long before jazz was born; it is Africa, because like Nigeria, slaves were brought from everywhere and the most primordial music that throbbed with visceral energy was born; it is the Caribbean and murderous slavery there too, but despite which, as in New Orleans a rhythm took root and a music took shape and it was like nothing on earth. All this in a relatively little place—the Congo Square—where African worship took place in the guise of a never-heard-before music: Jazz. 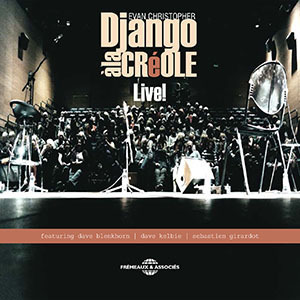 This is the music of Evan Christopher’s Django à la Créole, a band like no other. Django à la Créole was created by a group of musicians faced with the duress of digital distribution. However, it is no secret that they wanted the same thing: to make music that paid tribute to the real roots of jazz and to exemplify two things: The dignity and elegance of Duke Ellington and the visceral energy of Louis Armstrong, who just could not stop spreading good cheer through the music of jazz. On Live Mr. Christopher does exactly that. This is the third of the group’s recordings, and seven years down the road the band sounds just as effervescent and creative and inventive as the day the music of New Orleans was born. Sounding old—in a sense—and brand new and contemporary is no mean achievement. And yet it is not just notionally named after Django Reinhardt, because that Gypsy legend was as much a part of the history of Jazz and New Orleans as anyone else. And so the clarinet of Mr. Christopher meets the guitars of the two Dave’s—Blenkhorn and Kelbie—who return his every phrase with vivacity and sensuous abandon as well as with a risqué move or two. Evan Christopher is in a class of his own. His burnished woody tone is melded with the primeval whelp of early musicians. Albert Nicholas comes to mind, but Mr. Christopher is a singular voice. His lines are sophisticated and crafted with great intellect. And yet he has a visceral energy that comes from sliding through the New Orleans grassroots. Mr. Christopher can also create brilliant inversions in his mighty soli, sometimes drawing the guitar of Mr. Blenkhorn and the bass of Mr. Girardot in its wake. And he is a master of beginning a solo improvisation in the middle of a melodic phrase, as if the melody came from in his pocket. His own soli are sensuous; almost sexually inviting and if the other instruments were women, then they are most certainly seduced. Just listen to “Douce Ambience.” And listen to when he steps in the shadows and Dave Blenkhorn steps into the limelight… It is almost as if he were preening himself at such a seduction. The record is full of performances such as these and it is almost a shame to stop at mentioning just one of them. But there are also great performances by the other band-members. For instance Sebastian Girardot has an astounding solo in “Riverboat Shuffle.” And of course Mr. Kelbie is the backbone and the anchor of the ensemble sitting in for a drummer as much as he does for a rhythm guitarist. He is, quite simply, the best rhythm guitarist in the world. Just as Django à la Créole is one of the best bands in the world playing any kind of repertoire. Track List: Douce Ambience; Riverboat Shuffle; Dear Old Southland; One For The Duke; Mamanita; Solid Old Man; The Mooche; The Crave; Féerie; Manoir De Mes Rêves; Songe d’Automne. Personnel: Evan Christopher, clarinet; Dave Blenkhorn, guitar; Dave Kelbie, guitar; Sebastien Girardot, contrabass.